Sol's Legacy is not a typical horse riding program. Our focus is on building a relationship between our students and horses through Biblically based horsemanship lessons for children ages 8 to 14 years. 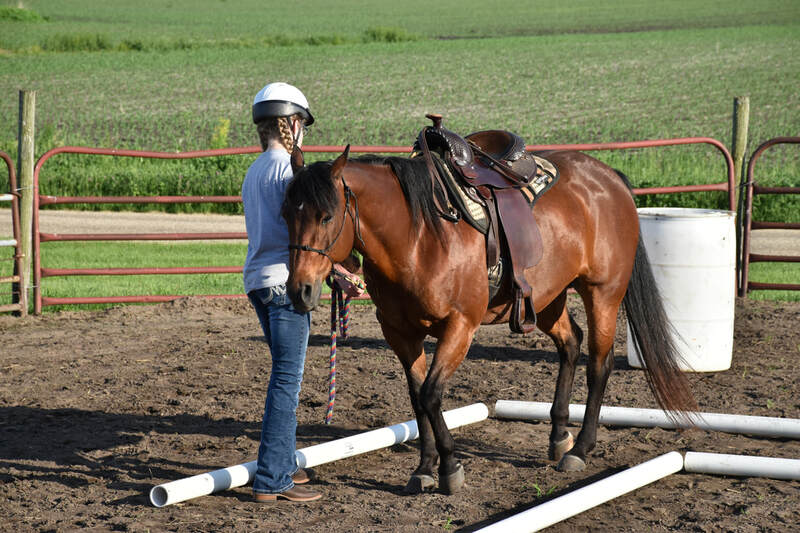 Through this relationship, children learn communication skills, gain an awareness and control of their body to better communicate with the horse, and learn to have a plan to be a leader for the horse. In this process, students gain confidence in their abilities! Our goal is that each student learn how they are a precious, loved child of God. Year after year, we continue to be amazed and blessed at what God does through our horses. Horsemanship starts on the ground. Therefore many skills such as grooming, tacking, leading, free-longing, mounting, and dismounting need to be taught before riding. Lessons will last one hour, unless the student requires a shorter time period. In addition to the instructor, there may be up to three volunteers per student. Session fees are $150. Scholarships are available on a per session basis for students needing assistance. Please contact Tonya Wells for more information on our scholarship program. Contact Tonya Wells if you would be interested in lessons in 2019! "After a couple lessons, 0ur grandson told his counselor how important it is to communicate with the horse, how you must stand tall and look forward as you walk. He even tied it into the way you approach people, and being confident. All this from our sometimes silent young man! What a great start you made with him Tonya. Prayers of thankfulness for what you do." "My step-daughter (age 13) has been receiving services at Sol's Legacy for two years. It has been an absolute delight to watch her just blossom as she learns about horses, about herself and about God. We have watched a shy, quiet, introverted girl just bloom under Tonya's instruction. She is happier, more confident, and all around more sure of herself."